It takes a leap of faith and courage to step outside of the comfort zone. Even if the comfort zone is uncomfortable, it is something that is familiar. There are times God calls us away from what we know. He says, “Come here, I have something better.” I think we want what He has for us, but it requires us to let go of what we have clung to for so long. We perceive it as a loss to let go now, I mean after all… we came this far, lets hold on a little longer. We resist change because what we think we have is all we know. Even if it is dysfunctional and unhealthy. It is like eating poison when we are hungry. We know the poison will kill us, but we give in to the hunger pangs. We reason at least it will fill our bellies, temporarily. When God calls us out, He tells us to not be afraid. He tells us to not look around, look only to Him. He knows if we take our focus off Him we will become afraid and intimidated by the storms that rage around us. Don’t think for one minute there will not be a storm when He calls you to lay something down, no matter if its a person, a thing, or a situation. Trust He will reach His hand out, grab it and don’t let go. Cuddle up next to Him and rest. Trust He will speak to that storm and there will be calm. Trust even more that in the storm you will have peace if you stay close to Him. Then He directed the disciples to get into the boat and go before Him to the other side, while He sent away the crowds. And after He had dismissed the multitudes, He went up into the hills by Himself to pray. When it was evening, He was still there alone. But the boat was by this time out on the sea, many furlongs [a furlong is one-eighth of a mile] distant from the land, beaten and tossed by the waves, for the wind was against them. And in the fourth watch [between 3:00—6:00 a.m.] of the night, Jesus came to them, walking on the sea. And when the disciples saw Him walking on the sea, they were terrified and said, It is a ghost! And they screamed out with fright. But instantly He spoke to them, saying, Take courage! I Am! Stop being afraid! And Peter answered Him, Lord, if it is You, command me to come to You on the water. He said, Come! So Peter got out of the boat and walked on the water, and he came toward Jesus. But when he perceived and felt the strong wind, he was frightened, and as he began to sink, he cried out, Lord, save me [from death]! 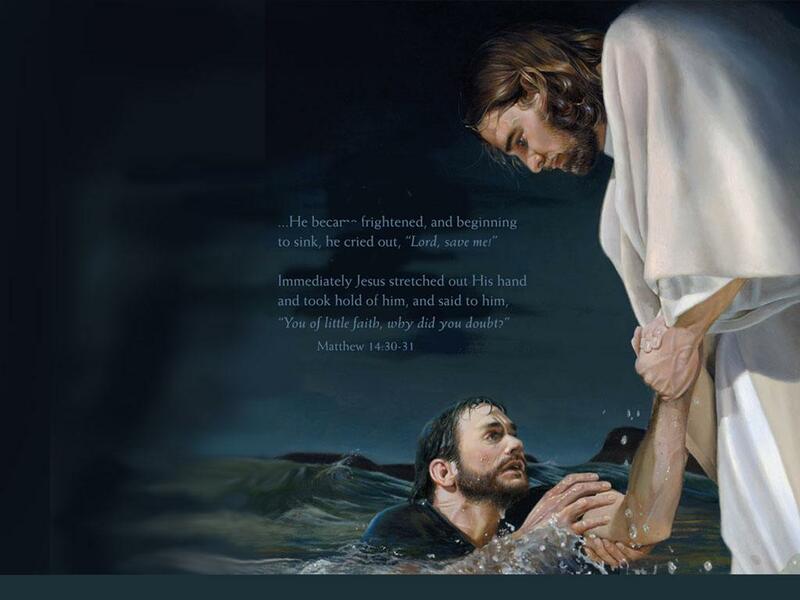 Instantly Jesus reached out His hand and caught and held him, saying to him, O you of little faith, why did you doubt? And when they got into the boat, the wind ceased. And those in the boat knelt and worshiped Him, saying, Truly You are the Son of God!